ETFs and index funds help passive investors keep their investing decisions simple. Whereas complex financial products spawn amazement, desire and disappointment in roughly that order, ETFs and index funds can deliver more important things, like diversified, low-cost portfolios on limited resources. Collectively known as index trackers, ETFs and index funds are each readymade packages of securities that deliver the return of a particular market (e.g. US equity) by tracking that market’s index. 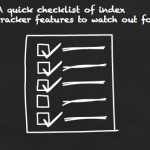 But not all index trackers are created equal. 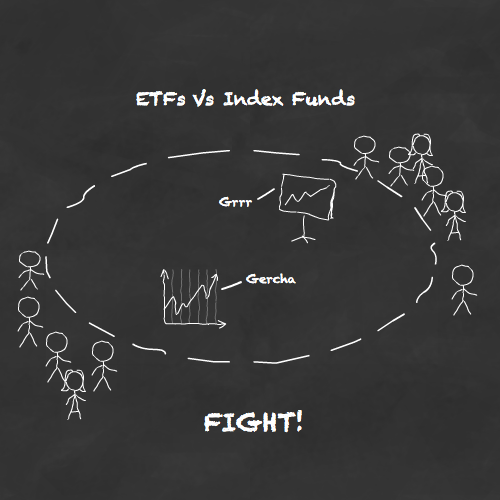 Despite sharing plenty of DNA, it’s worth knowing the differences between ETFs and index funds – just as you’d prepare differently for a tea party of chimpanzees versus a visit from Auntie Hilda, even though they’re 99% genetically alike. Most index funds are set-up as Open-Ended Investment Companies (OEICs)1 while some are Unit Trusts. The US equivalent is the mutual fund. OEICs and Unit Trusts are closely related. They are called ‘open-ended’ vehicles because the supply of shares in the fund is not restricted. The fund manager can create new shares to meet demand from buyers and cancel shares to meet obligations to sellers. The big difference between an ETF and an index fund is that ETF shares trade on the stock exchange, just like ordinary shares. In the UK, ETFs are listed on the London Stock Exchange (LSE). Another major departure is that an ETF doesn’t necessarily hold the securities of the index it claims to track. Physical ETFs actually do hold the assets of their index. They either replicate the index in full or sample a proportion. 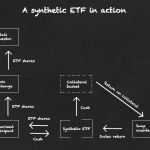 In stark contrast, a swap-based or synthetic ETF uses derivatives to track an index. The ETF hands over a basket of securities as collateral to a financial institution (such as a major investment bank) in return for a swap contract. The ‘swap’ is a guarantee by the financial institution to pay out the return of the required index, in exchange for the performance of the collateral it’s been given. Swaps are meant to reduce cost and tracking error. But they also expose the ETF to counterparty risk, and potential exposure to a Lehman-style collapse. If the counterparty goes bust then the ETF loses its ‘guaranteed’ return. Some synthetic ETFs use multiple counter-parties to spread the risk. 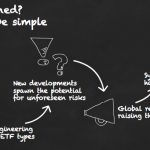 The counterparty risk should be limited to 10% of the ETF’s net asset value if you choose a UCITS compliant ETF (check the ETF’s fact sheet). You can avoid counterparty risk altogether by choosing ETFs that physically replicate their index and that don’t partake in securities lending. Check the ETF provider’s website for its policy. The open-ended structure of an OEIC means its price reflects the underlying value of its assets, rather than any fluctuations in supply and demand for the fund itself (unlike, say, an investment trust). For an investor, that’s one less thing to worry about. If the fund’s assets rise in value then so does the share price of the fund. If assets fall in value, so does the fund price. Easy. The price is calculated once a day, according to a FCA regulated formula for calculating a fund’s net asset value (NAV). Bizarrely, you don’t normally know what price you will pay for a fund. This blind purchase, euphemistically known as forward pricing, means you pay the price of the fund at its next valuation point (usually 12pm). So if your order is placed at 2pm, you’ll pay whatever the price is at the valuation point the next day. It sounds wrong, it feels wrong, but there’s no getting around it. One consolation is that you’ve got about as much chance of paying a lower price as a higher one, after you’ve ordered. The ability to buy and sell ETFs on the stock exchange means their price is subject to change all day – although you do at least know roughly what it is before you buy. ETFs can be and are traded in real-time by fast guns attempting to earn a day’s wages before breakfast, although this is a dangerous game that passive investors like me resist. The point is ETF prices are therefore prey to the whims of the market place, so they can trade at a premium or discount to the value of their underlying assets or NAV2. Unlike investment trusts, ETF price discrepancies are generally small and quickly arbitraged away by the market. Long-term passive investors don’t need to worry because we avoid trading in illiquid instruments and at times of great market stress. As with other shares, it’s possible to use stop, limit and open orders when buying ETFs. Limit orders are particularly useful in enabling you to set your maximum buying price and minimum selling price. Unit Trusts have two prices: a buying price (bid) and a selling price (offer). This is known as the bid-offer spread. It means you’ll pay more to buy into a fund than you will get for selling it a second later, just like when you buy foreign currency for a trip abroad. This is a cost of trading because you’re instantly down at the moment you’ve bought your units. OEICs offer a single price, which sounds like a rare dose of normality, except the spread still exists – it’s just concealed in other charges. Happily, the bid-offer spread isn’t just plucked out of the air by rapacious trust managers. The maximums and minimums are limited by the FCA formula mentioned above. Naturally, a lower bid-offer spread equates to lower costs for buyers and sellers. Passive investors can rest easy though, as this cost anyway recedes in importance over the long haul, due to our lack of trading. The bid-offer spread of an ETF is determined by supply and demand, unlike with an index fund. The more buyers and sellers you have, the more likely the bid-offer spread will be narrow. On a small, illiquid ETF, the spread could be over 1%. That is going to hurt. It’s a cost that needs to be taken into account when comparing ETFs, especially if your tastes run to the more exotic ends of the market. The best way to get a tight spread (the lowest are a few hundredths of a %) is to choose large and liquid funds. Assets under management – a larger figure indicates a larger fund that’s likely to be more liquid. Daily trading volume – a high volume suggests a liquid fund with many buyers and sellers. Number of market makers – the higher the number the better, as they compete to drive down the bid-offer spread. You can check the bid-offer spread and the other relevant information on the website of the ETF provider, the stock exchange, or through your broker. The main expense spared with index funds is broker’s commission, if you choose a broker that doesn’t levy dealing charges on funds. Take a look at the percentage fee brokers on our broker comparison table. This makes index funds ideally suited for small investors who want to make regular contributions. Broker’s commission can seriously deflate returns on small investment sums, because it’s charged at a flat rate. See the section on ETF costs below for a chilling example. If your assets amount to more than around £25,000 then you may well be better off going for a flat-fee broker and paying dealing charges. The calculation is pretty straightforward. There is much ado online about how the Ongoing Charge Figures (OCF) of ETFs are cheaper than index funds. While that’s generally true in the US, the picture is far murkier over here, and I’d dismiss that as a rule of thumb in the UK. Broker’s commission is the big additional cost attached to ETFs that small investors need to be lively to. You won’t pay an initial charge for an ETF, or an exit fee, the OCF will be sweet, but the dealing charge you pay to buy and sell can ruin everything. How so? Well, most good online brokers will charge around £10 per transaction. If you want to drip-feed £50 a month into an ETF then the dealing fee just cost you 20%. Disastrous. In fact, any dealing cost beyond 1% of your trade is excessive and I personally aim for 0.25%. Dealing costs quickly rack up and render ETFs unsuitable for drip-feeding or frequent rebalancing, when you’re dealing in modest sums. The way around this for small investors is to hold for the long-term and to build up large lump sums to invest. Another good tip is to use regular investment schemes such as the Share Dealing service at Interactive Investor that only charge £1.50 per trade. You pay stamp duty on the underlying assets of a UK equity fund. This is a hidden cost because it’s usually bound up in the price you pay per share but it won’t be greater than 0.5%. Leading index fund provider Vanguard charges stamp duty upfront because its corporate culture errs on the side of transparency. The same is true of ETFs. You’ll pay the hidden costs required to purchase the underlying assets of the ETF. If you read that stamp duty isn’t payable on ETFs this is referring to the fact that you don’t pay stamp duty to acquire the actual ETF itself – unlike with investment trusts or many individual shares traded on the UK stock exchange. The world of index funds feels like a stagnant back-water next to the whirling white hot action of the ETF scene. There’s too little choice in most market segments, and entire asset classes like commodities, value and UK small-cap are index fund-free zones. The problem with ETFs, in contrast, is there’s almost too much choice. ETFs have caught fire in recent years and the response of the financial industry, as ever, is to pile in with a raft of innovative and exotic new products. The flip-side of innovative and exotic is risky and bewildering. The danger is that investors are lured away from vanilla ETFs by the promise of adventure, only to come a cropper using expensive products they don’t really understand. Each to their own, but it’s worth being aware that ETFs don’t all work the same way and some track very risky markets. Exchange Traded Commodities (ETCs) – track commodity prices. Exchange Traded Notes (ETNs) – often track esoteric markets like currencies, volatility, and carbon emissions. Certificates – a European version of an ETN. 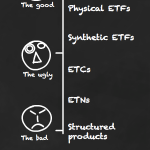 Fundamental ETFs – track indices using fundamental measures of value (e.g. dividends, cash flow, sales, or book value) rather than weighting by market cap like conventional ETFs. You won’t go far wrong if you stick to straightforward ETFs that track big, diverse markets like the developed world, the US, the UK, and the emerging markets. Steer clear of products aimed at specific industries – you’re not rewarded for taking on that type of risk. Buy cheap index funds from an online broker / platform. Whenever possible, I choose to fill my portfolio with index funds rather than ETFs. They are simpler to understand, use, and manage. There are fewer complications when it comes to drip-feeding and rebalancing, and they’ve been around since 1975. Why do I bring that up? Well, ETFs first appeared on the scene in 1993, but have really only taken off in the last several years in the UK. All things being equal, I’d rather entrust the bulk of my money to the product that’s got the longest history of avoiding financial scandal. But that’s just me and my paranoid mind. Still, ETFs are recommended by many of the doyens of passive investing. And I do use them myself to track parts of the market where index funds are either too expensive or simply don’t exist. ETFs are unmatched for choice and diversity and passive investors shouldn’t worry about mixing and matching with index funds to create their ideal portfolio. something weird is going on there, Harps. According to Vanguard’s website, the two are clones in nigh on every respect bar returns. Same cost, same no of holdings bar 3, same top 10 holdings, same geographic and sector split. They even follow the same index, yet the index returns are reported very differently for the two funds as well. Which can’t be right. Have you emailed Vanguard about it? I’ve checked the return numbers on Morningstar and Trustnet but they don’t tally with Vanguard’s. I’m wondering where this assertion comes from? 2. In the above article, I can’t really see anything relating to dividends. Generally, index funds can be bought in two flavours: “accumulation class” (dividends automatically re-invested) and “income class” (dividends paid out). Now as far as I know, this is not the case with ETFs – dividends are automatically paid out. (Although I think if you use Vanguard as a broker, there is an option to automatically reinvest dividends on ETFs). Should this difference between index funds and ETFs ever be a consideration (for someone who wants to ‘accumulate’) when trying to choose between ETFs and funds? Or is it only a consideration for those who are too lazy to reinvest their dividends every quarter? I hope someone (maybe even The Investor / The Accumulator) could answer the above. … OK, I want to track the world equity markets as best as I can, and have it as a large part of my portfolio – I’m a follower of Lars Kroijer with a highish risk tolerance. I’m currently swaying towards Vanguard’s FTSE All-World UCITS ETF (VWRL), which seems to be a popular choice. The £25K figure comes from an analysis of a fund portfolio benefitting from £0 trading fees and a low platform fee versus an ETF portfolio that pays trading fees. Some ETFs are available in accumulation flavour (also known as capitalising in ETF circles). Though it’s only a fraction in comparison to index funds. Yes, I think it should be a consideration if you’re just starting out and have a very small portfolio. Anything you can do to reduce trading charges is a good thing. I’ll take a stab at the new figures, but if anyone thinks I got it wrong, they are probably correct. (a) If div income is covered by personal allowance/£5k div allowance (reducing to £2k from April 2018)/ISA/SIPP, no UK tax, so total tax suffered is 15. (b) Basic rate taxpayer pays 7.5%, on the gross 100 div, but offset 15 WHT, so no further tax to pay. Total tax suffered is 15. (c) Higher rate taxpayer pays 32.5%, minus 15 credit. Total tax suffered = 32.5. Assume 100 dividend income earned by the ETF. US WHT = 15. ETF declares dividend of 85 to UK investor. (b) Basic rate taxpayer pays 7.5%, on the 85 div = 6.375. No WHT credit, as the ETF suffered it, not the UK investor. Total tax suffered is 21.375 (versus 15 on the US listed ETF). (c) Higher rate taxpayer pays 32.5% on the 85 = 27.625. Total tax suffered = 42.625 (vs 32.5 on the US listed ETF). “Just for completeness, here’s my guess about the tax hit on the divs from a UK unit trust investing in US equities, under the new dividend tax rules. UK UT receives 100 of dividends from shares in its portfolio, but suffers 15% US WHT, so receives 85. It is taxable at 20% in UK, so UK tax on the gross income of 100 is 20, but claim tax credit for the WHT, so UT has a further 5 UK tax payable. UT has 80 income, net of tax. It then pays cash dividend of 80 to UK investor. No tax credit any more. Basic rate tax payer pays 7.5% on the 80, so is left with 74. Total tax cost 26 (vs 21 for UK listed foreign ETF and 15 for US listed ETF). 40% tax payer pays 32.5% on the 80, so ends up with 54. Effective rate of tax on the underlying 100 is 46%. So, that’s 3% worse than a UK listed ETF, and 13.5% worse than a US listed ETF. It seems like, even if you avoid US-listed ETFs, a UK-listed Irish-domiciled ETF is superior to a UK-listed OEIC/UT (assuming both are investing in foreign equities) purely for tax purposes. Provided the UK OEIC/unit trust invests solely into equities, then it should not pay any UK corporation tax (UK and non-UK dividends are franked, and therefore exempt from corporation tax, as are capital gains). The UK OEIC/unit trust will still be subject to US withholding taxes on US dividends received (at 15%). Therefore, there is no difference in the tax position between an Irish OEIC/ETF and a UK OEIC/unit trust – for equity funds at least. A UK OEIC/unit trust does have to pay UK corporation tax (at 20%) on non-dividend income received. However, they can deduct management expenses and all interest distributions to investors first. As such, there is again no difference in the tax position between an Irish OEIC/ETF and a UK OEIC/unit trust – for funds that pay interest distributions (those with more than 60% of their assets in debt instruments). That only really leaves a relatively small minority of funds that still have any meaningful UK corporation tax liability, because they receive a non-trivial amount of non-dividend income but are unable to declare interest distributions. It may be worth noting that multi-asset funds such the Vanguard LifeStrategy funds with 40%, 60% and 80% equity are among these (and these accounted for almost all of the UK corporation tax paid by Vanguard last financial year).